The ability of Equine Rhinitis A Virus (ERAV) to infect and spread among yearlings have been highlighted in a Canadian study. The findings show that between the ages of 1 and 2 may be a critical period for the development of ERAV respiratory disease, meaning that prevention strategies should be targeted at this age group. Tanya Rossi and her colleagues have reported on their study, involving 96 Standardbred racehorses housed at a multi-barn training facility in southern Ontario, in the journal Frontiers in Veterinary Science. 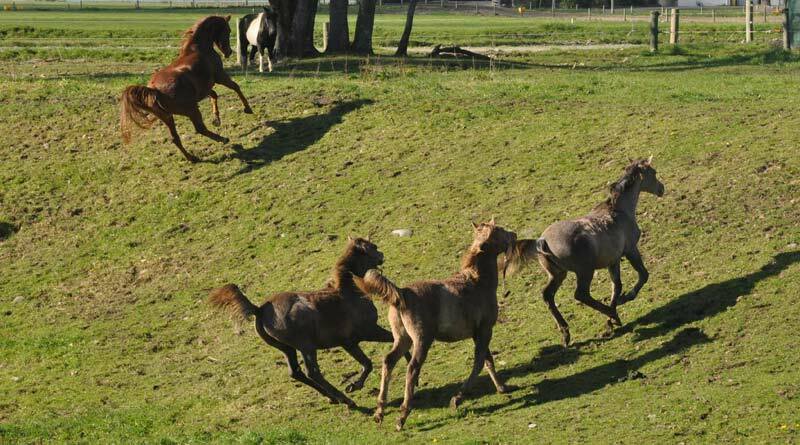 The horses were aged 1–5, with roughly half of them yearlings. The University of Guelph research team set out to describe the transmission and clinical course of infectious respiratory disease among the Standardbreds. They sought to identify demographic, serological, and contact network risk factors associated with ERAV respiratory disease. Young racehorses commonly come down with viral respiratory infections. Most get well quickly, but such infections can have big welfare and financial implications. Infections may predispose horses to bronchopneumonia and equine asthma, both of which can affect performance and shorten athletic careers. Even without complications, clinical disease involving the airways can last weeks or months, impacting training. Indeed, a study of yearling Thoroughbreds showed that respiratory disease was the third most common cause of training failure. Since its discovery in the 1960s, the importance of ERAV – previously called Equine Rhinovirus-1 – as a cause of acute respiratory disease has been debated. Despite the high seroprevalence in performance populations, ERAV was rarely isolated from clinical cases in the past. However, more recent studies have shown it is a common cause of upper and lower respiratory tract disease in horses. Viral shedding can persist for at least 37 days. Clinical signs vary but usually include fever, lack of appetite, cough, and discharge. The primary route of disease transmission is likely through direct horse-to-horse contact and inhalation of respiratory droplets from nearby horses, although indirect contact through human handlers, shared equipment, and contact with infected urine and feces may also play a role. Therefore, equine contact patterns are likely an important component of disease transmission for this pathogen. Measures that target contact patterns may have big potential for disease prevention and control, they said. For the study, clinical signs were monitored daily over a 41-day period in fall 2017, with the study team looking for patterns in the incidence rate, prevalence and incidence risk. Horses were housed on the property year-round and purchased yearlings entered the facility during fall. Blood tests indicated that 75% of the respiratory cases during the 41-day study period related to ERAV. The risk of yearlings falling ill was much higher than for the older horses. Indeed, 87.9% of them did so. Clinical disease was overwhelmingly seen in the yearlings (96% of clinical cases), while no illness was seen in any horse aged 3 or older, most likely due to acquired immunity from previous viral exposure in older horses. Even 2-year-olds had only a fraction of the risk of developing clinical disease when compared to yearlings. “Disease control strategies, such as vaccination programs and isolation of new horses arriving from auction, should be targeted at young animals entering training facilities,” the study team said. In racehorse populations, yearlings are often bought at auction, where they are mixed with other animals, and then transported to training facilities where they are exposed to new horses. The increased risk in yearlings seen in the study may have been affected by immune factors, lack of previous exposure to ERAV, and differences in contact patterns and management practices between age groups. Grouping or isolating new arrivals to reduce horse to horse contact, stress reduction, and allowing adequate time for getting used to their new surroundings may decrease the incidence of ERAV respiratory disease in training facilities, they suggested. The full study team comprised Rossi, Terri O’Sullivan and Amy Greer, from the University of Guelph, and Alison Moore, with the Ontario Ministry of Agriculture, Food, and Rural Affairs. The study received funding from the Ontario Ministry of Agriculture. Tanya M. Rossi, Alison Moore, Terri L. O’Sullivan and Amy L. Greer.